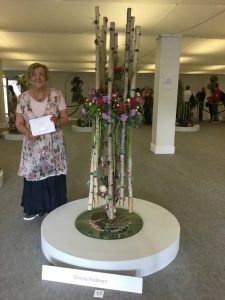 Diana Holman with her exhibit “Beneath the Waves” which won a silver medal at the Chelsea Flower Show for Dorset & Guernsey Area. Photo courtesy of Caroline Jackson, NAFAS Press Officer. Philippa Louden & Elaine Knight’s “The Earth and the Moon” won a Silver Medal at the RHS Malvern Spring Show for the Dorset & Guernsey Area of NAFAS. Dorset & Guernsey Area of NAFAS has the particular distinction of being the home of Mary Pope, the Founder President of NAFAS. She is well remembered by members as a frequent visitor to their clubs’ special events. Originally part of the South West Area, we became the 19th Area of NAFAS in 1970. Although the smallest Area, we have enthusiastic members who have a keen interest in all aspects of floral design and they are keen to exhibit at flower festivals, in churches, in public places and in country houses. Our Area Show provides the opportunity for our creative members to compete against each other. Our members also regularly compete at the National Show, at Chelsea and at Malvern where they achieve high awards. We have a range of clubs throughout the county. 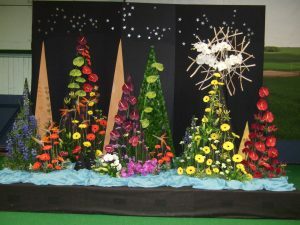 Generally they meet once a month and their programmes are varied, some have mainly hands on activities, others provide more floral demonstrations or talks. The programmes are tailored to suit their membership. They aim to encourage members from beginners to those at the highest level. Our active Teachers Association gives opportunities for its members to keep up to date with the latest trends by providing stimulating workshops led by creative tutors. 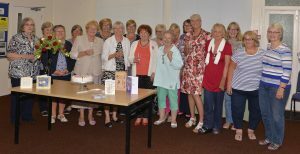 We are delighted to welcome the members of Dorchester Floral Group, a newly formed club, to our Area.